This isn't an outfit per se, but I do love all of these pieces individually. Lately I have really been into white nail polish. For the longest time I dismissed the trend, thinking that it looked reminiscent of middle school girls dousing their nails in white out while bored in science class. Not a good look. But a few weeks back I watched a film called Save the Date, in which the main character, played by Lizzy Caplan, flawlessly wore a white manicure throughout the entire film. It looked perfect on her, subtle, transitional, and effortlessly cool. I get the feeling that Lizzy Caplan herself is effortlessly cool, she just has that look. Thus I was inspired to give it a try, and I love it. I also love every last detail of this Alice by Temperley dress. 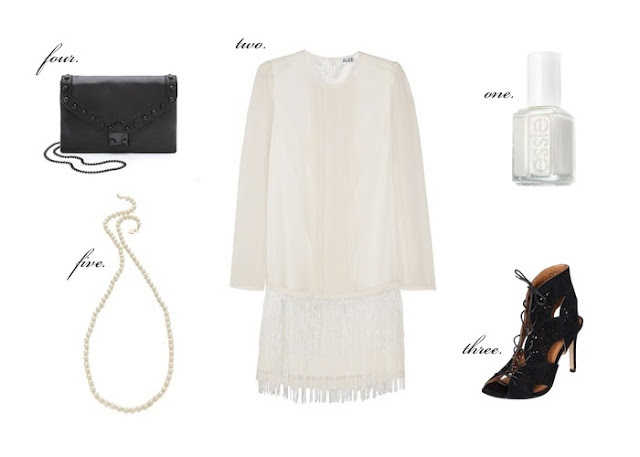 It's the perfect balance of modern and 1920's complete with a fringed skirt. Fringe is a fine line to walk, one false step and you end up with that cheap flapper costume look, which is equally as cringeworthy as having white out on your nails. On a side note, I really enjoyed Save the Date and highly recommend it. For reference, it has the same sort of feel as Adventureland, which coincidentally also features Martin Starr.